1. 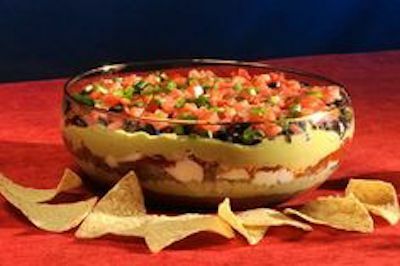 Layer beans, layer sour cream mixed with taco seasoning, guacamole, & cheeses. Put in refrigerator. 2. Mix tomatoes, chopped onion & peppers. Add a dash of olive oil, red wine vinegar and cilantro. Put in refrigerator. 3. Just before serving put the tomato mixture on top. 4. Serve with LOTS of Tortilla chips!